Curated by Charley Peters, Signal to Noise subtly reveals a multitude of relationships between the artists, which oscillate on a spectrum between collusion and tenuous connections. Signal to Noise brings together emerging contemporary artists in order to celebrate the divergent nature of their individual practices, instead of making ambitious claims to force each artist into an overall thematic concern. Curated by Charley Peters, Signal to Noise subtly reveals a multitude of relationships between the works, which oscillate on a spectrum between collusion and tenuous connections. The gallery becomes a site for exchange, where individual artistic identity is both challenged and complimented by the practices of others. Upon entering the gallery and taking in that first sweeping view, it becomes necessary for the viewer to search for commonalities within a space that contains an abundance of distinctions. 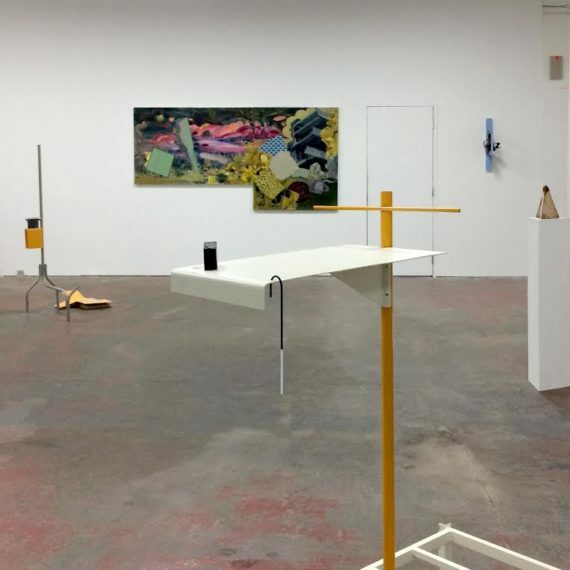 Within the context of this kind of group show, there is also the tendency for the viewer (and indeed the writer) to seek out works which respond to an established area of interest. Signal to Noise asks the viewer to select their own starting point from a wealth of beginnings. This text starts towards the back of the space, where organic forms ripple within the geometric confines of wood panel and canvas. Frederic Anderson’s careful drawings of Mont Blanc depict a landscape which appears to be porous. Lines fluctuate across and upwards, exposing the pale wood of the panel and thus, exposing the mountain as a living and breathing entity. On the wall next to Anderson’s drawings is Jing Guo’s Bodyscape. A similar ripple of line flits across the canvas, making a modest suggestion of a physical presence. The body here is defined by the contours of white space. As a duo, these works allow a meditation between landscape and the body. As a result, the mountain becomes less monumental and more elemental, a transient and shifting entity, much like the considered movements of climbers who traverse Mont Blanc’s perilous rock face. The natural world reappears in Cara-Jean Flynn’s sculptures. With Anderson’s and Guo’s wall mounted works in the background, Flynn’s Disrupted Order looks like a perfect alpine peak but, is in fact a cast bronze pyramid topped with an impression of spiky romanesque broccoli. Across the space Flynn’s Vegetable or Mineral? features a bronze romanesque broccoli again, this time as the summit itself, surrounded by a ring of cast geometric forms. The heaviness of the material and the angles add a contrasting materiality to the lightness of Bodyscape and Mont Blanc. Disrupting the centre of the gallery space are a pair of sculptures by Daniel Curtis titled: People standing around at an after work party. People that you think you recognise, seeming familiar, but that you can’t quite put your finger on, making you wonder if you know them at all. It is worth imagining these sculptures working the room according to the script the title gives them. Spartan constructions of metal, a clothing rail, wood and copper become awkward performers. They are nodding towards traditions of modernist sculpture but, they are not modernist themselves. 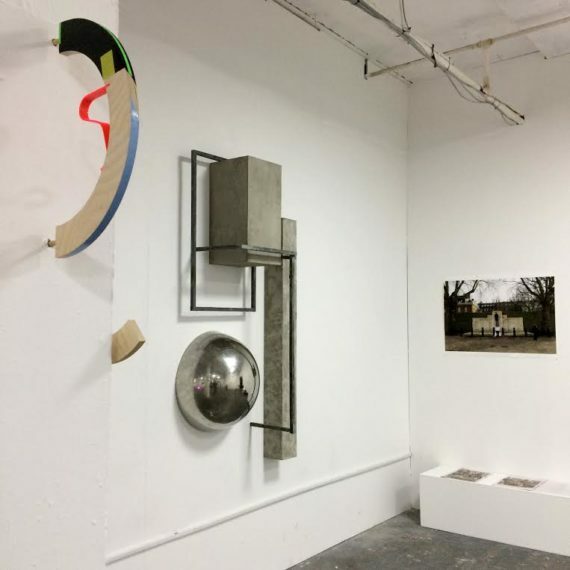 Curtis’ sculptures look out across the space at Yuchen Fang’s brutalist looking Precarious Corner (a wall mounted assembly of concrete, mirror and metal) and shudder. For it is they who feel precarious. The architectural, concrete, construction and under-construction feature throughout Signal to Noise. The brilliant neon orange of hi-vis jackets on building sites weave through Andrea Coltman’s series of paintings Under Construction, where rough-edged tangles of metal spread across small canvases in grids. Situated behind Coltman’s paintings is Improvisation with Strings II, a collaboration between Froozan Nazaari and Antony Dixon. Strings are stretched across the top of the corner, where one is not entirely sure if they will come tumbling down or if piece the itself is under-construction. There is a sense of the performative here, alongside modernist sensibilities in terms of the aesthetic. Gravity is brought back into focus by Charlie Lang’s Pillars. 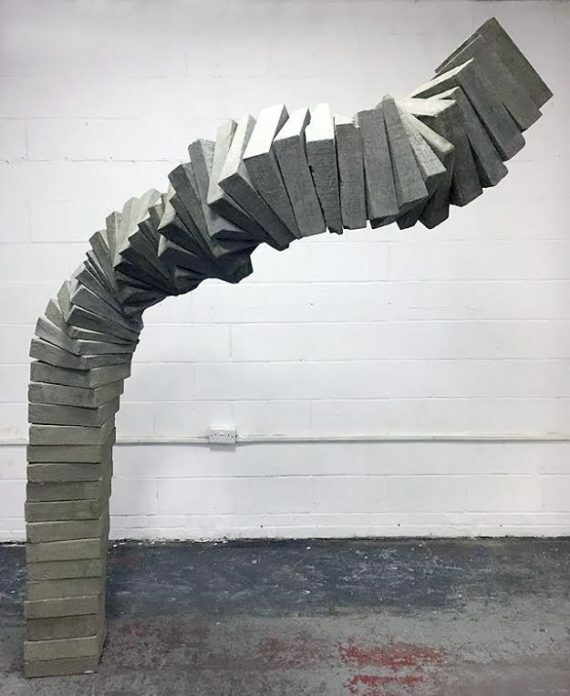 Thrust into the space is an arch of flat grey bricks, seemingly held into place by a stubborn refusal of the laws of physics. The bricks themselves are illusionary, are they concrete or are they foam? The movement of the arch is again, performative. Their stacked construction proposes that there could be many iterations of the piece. The scale of Pillars means the sculpture acts as a beacon in the space for the explorations of modernism in the show. The modernist aesthetic is seductive, and indeed within my own writing I can attest to its charms, and it is interesting to see that the appeal has not waned here. Jacqui Hodge’s sculptures of wood, plastic and paint discreetly jut out from the walls, providing riffs on colour and shape. Warped plastic slouches on geometric forms in Hodge’s Suga Mama and Can I Walk With You. 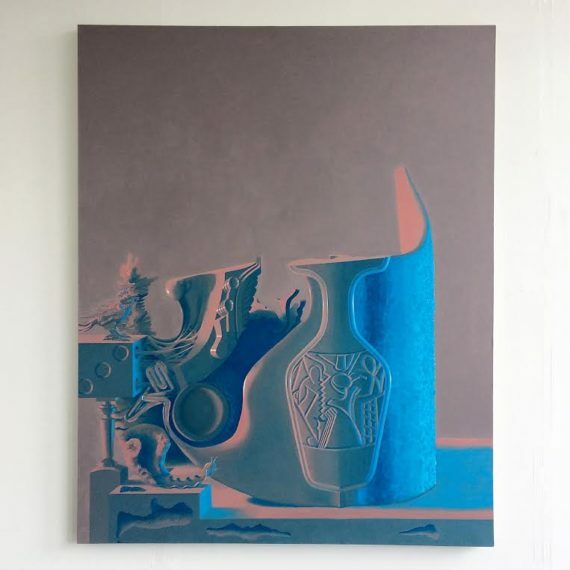 So, shifting the eye back to Pillars and one cannot fail to notice the disruptive nature of Tom Waring’s giant painting Phunke; an iridescent, neon, still-life imbued with post-modern and baroque influences. The contrast provides an excellent backdrop to the prevalence of geometry in the exhibition. This contrast permits me to return to Curtis’ socially awkward sculptures as a metaphor, in order to note that there are of course artists who do not necessarily fit into the narrative supplied here (which is obviously not to say the works themselves are awkward). Inês M. Ferreira exhibited an intriguing inquiry Homage to Tank Man and Johnny Fox provides a comedic punctuation with Great Bone Idol where a 3D printed infamous cartoon mouse lies on the gallery floor in a trap. Ultimately, Signal to Noise proposes questions about how emerging artists navigate their relationships with theory, materials, process and, their peer group. Peters’ curatorial strategy challenges the viewer to consider their position in relation to these contemporary art mechanisms by providing a multitude of directions for consideration.